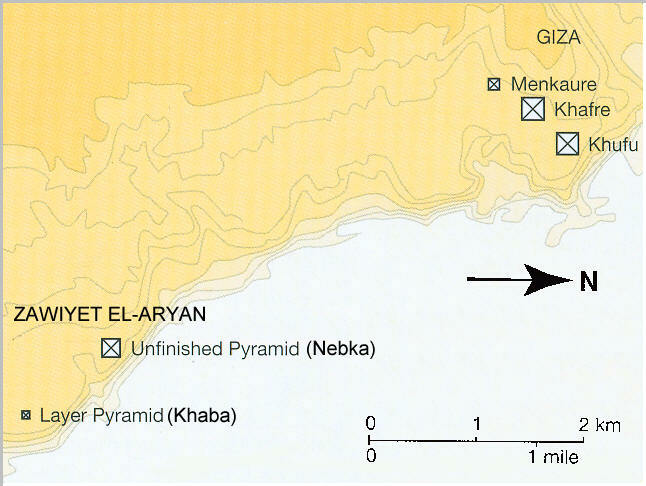 The site of Zawiyet el-Aryan is about 4km southeast of the pyramids of Giza. There are two identified pyramids here, both unfinished. The site itself is difficult to reach due to the fact it is very near a military compound. The name refers to the nearby town, although the locals themselves haven't used used this name for more than 50 years. The easiest pyramid to get to, is the Layer Pyramid of Khaba, the 3rd King of the 3rd dynasty. It appears as a slumped pile of ruble 16m high. It's layer structure is quite evident. The pyramid is a 10 minutes walk into the desert.